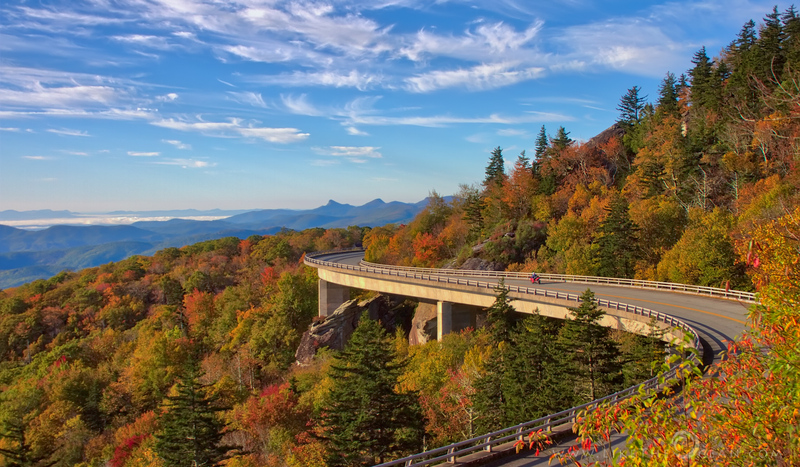 The Blue Ridge Parkway experience is unlike any other. It provides a slow-paced and relaxing drive revealing stunning long-range vistas and close-up views of the rugged mountains and pastoral landscapes of the Appalachian Highlands. The Parkway meanders for 469 miles, protecting a diversity of plants and animals, and providing opportunities for enjoying all that makes this region one of a kind. Among the uncountable vistas and views, this iconic view of the bridge also stands out, more so after learning about the engineering behind it (below is from the Linn Cove Viaduct Visitor Center). A viaduct is a long bridge with a series of spans supported on piers. The Linn Cove Viaduct is 1243 feet long and 35 feet wide. This signature view of “S” curve rests upon seven vertical piers spaced at 180 feet. Linn Cove Viaduct is the first in the US to incorporate progressive placement of sections (each of the 153 precast sessions weighing 10,000 lbs). What this means is that the bridge is built upon itself. Workmen, materials and machines move back and fourth on the completed bridge to places each successive section. Little or no damage is caused to the landscape over which the viaduct is being constructed. Grandfather Mountain is rugged and unyielding with active plant and animal communities throughout. Traditional road and bridge construction involving heavy equipment, earth moving, access roads and large construction crews would have adversely affected this fragile eco system for years to come.